After just 12 years away from Newfoundland, though longer than that away from the small outport I grew up in, when I go back now I feel a bit like a tourist. I hear my family speak and it almost seems like they're affecting an accent. Was it always that thick? And, when I think of my childhood, growing up near the ocean and all that that entailed, it feels like I'm reading a novel about someone else. Could that ever have been my life? In the epilogue to As Long as the Rivers Flow it states, "When Lawrence finally went home at age fourteen, he felt like a stranger. He tried to recapture the feeling of freedom he had when he left with his family in the bush, but things were never the same." Where was Lawrence returning from? Residential school. And try as I might, I cannot relate. Whereas I left as an adult, Lawrence left as a child-- when many of us would argue, he was at his most impressionable. Whereas I left by choice, Lawrence was forced. Since I've been away, I could have made a bigger effort to keep in touch with my Newfoundland culture. I could have hunted and fished, I could have been reconnecting and talking with more Newfoundlanders (no shortage of us anywhere). I could be buying Newfoundland food found right here in the local grocery stores. Not doing so (at least not often), has been a personal choice. Loyie, in the residential school, had no choice. If he tried to speak in his traditional language, he could have had his mouth washed out with soap or have been strapped. So, after all of this, if I struggle with fitting back in, imagine how Lawrence and others like him must have felt. These thoughts, as I've indicated above, sprang from a couple of sentences in the epilogue, but it's the story itself, and when it takes place, that sets this one apart from the other residential school books that I've read. Instead of focusing on the after effects, or even life at the residential school, Loyie's tale takes place before he even goes and ends when he is in the back of a pickup truck being taken away. This is an important distinction because it sets the subtext for the rest of the book: that Loyie was already getting an education before even setting foot in a school. I'm of two minds about this subtext. I agree, of course, in the message, but it sometimes felt very heavy-handed, more text than subtext. Everything is a lesson and at times it feels like a school book, which seems almost tragically ironic. Granted they are important lessons, that tell of practical life skills and followed up with a hands on experience approach to learning... but it's written in a book. I'm the last person to downplay the importance of books, but the medium is also a message. It's certainly more interesting than a typical textbook, and quick anecdotes about adopting an owl and a grizzly bear encounter add a level of excitement, but it still felt forced at times. The most subtle lesson, and in my opinion the more successful one, was about the importance of familial bonds. Lawrence spends his days amongst his extended family, whom he learns with, laughs with, loves, and respects. How could a residential school, even if it had wanted to, compare to that? 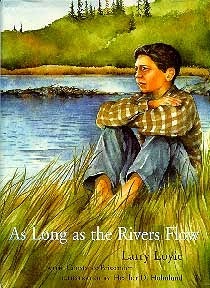 Larry Loyie wrote a sequel to As Long as the Rivers Flow entitled Goodbye Buffalo Bay (Theytus) about returning home and moving on. It's a finalist for two awards: Norma Fleck Award for Canadian Children's Non-Fiction (Nov 18 award ceremony) and Golden Oak Award (Forest of Learning, July 2016). Larry won the first in 2004. Let's go Larry with co-authors Wayne K. Spear and Constance Brissenden!